Convenient parking is available for The Strand Theater. Refer to the map for more information on nearby parking. The American Conservatory Theater's The Strand Theater is located directly across from Civic Center's UN Plaza. 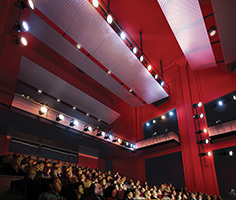 The theater boasts a 283-seat theater, a 120-seat event and performance space, and a welcoming lobby and cafe that is open to the public. The Strand hosts the A.C.T's productions each season, including specially commissioned new work, cabaret, and theater performances by A.C.T. 's M.F.A. Program and Young Conservatory students, educational workshops, special events, and more.